What is the difference between endogenous and exogenous variables, considering the determinates of demand. - FreeEconHelp.com, Learning Economics... Solved! Home example law of demand microeconomics What is the difference between endogenous and exogenous variables, considering the determinates of demand. 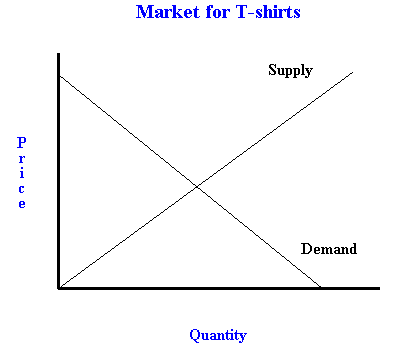 Consider the following demand function, which shows quantity demanded as a function of exogenous variables and price. 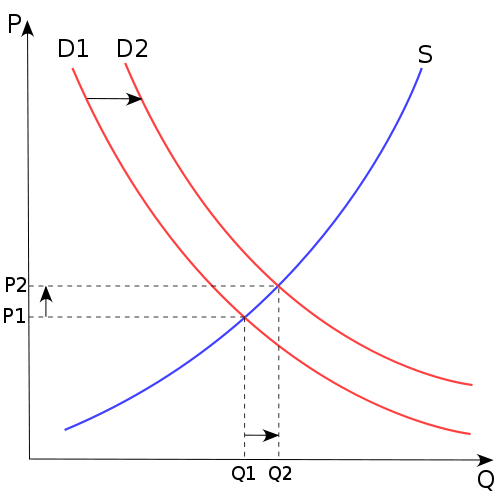 Where Qd is quantity demanded, a is the intercept, b is the slope coefficient for P price. When we consider the endogenous factors in this model we only have one variable on the right hand side which has its own coefficient, which is price. Because the relationship between price and quantity is known (it is the coefficient b) it is considered endogenous to the model. Quantity is on the left hand side so it is considered the dependent variable (but also endogenous). The exogenous are all considered within the a variable, which gives us the intercept. They are considered exogenous because they are determined independently from the model... when Q or P changes, we do not expect the variable a to change. This makes sense both mathematically and intuitively. 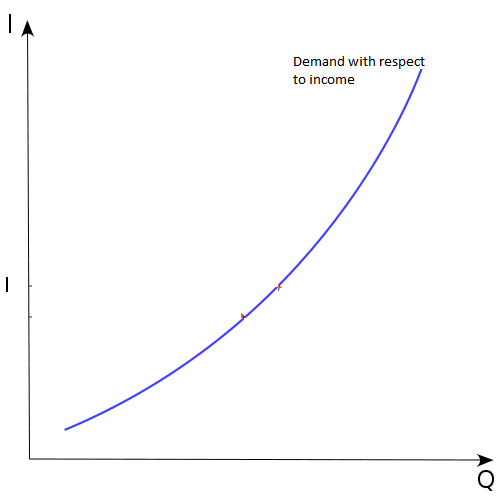 Mathematically the only variables that are allowed to change (and therefore be graphed) are Q and P. While b and a can be changed by the user, they do not react to changes in quantity or price. Intuitively, this makes sense because changes in income and tastes and preferences are not directly affects by quantity and price. Just because the price of a good changes does not mean that our income changes. Our income is determined by other factors outside of the supply and demand framework and is therefore exogenous. Here everything is the same except for the I variable which represents income. Because income is on the right hand side with a coefficient (which determines the slope) it is now the endogenous variable in this model. 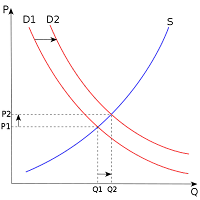 Now the price variable is exogenous and is considered in the a variable which determines the intercept. 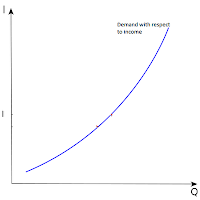 Here is what the graph would look like below for a normal good (as income goes up, quantity demand goes up). This may seem a bit confusing at first, how can price be exogenous in one model and endogenous in another? The reason is because of the assumptions we are making and the functional forms of the models we choose to use. Sometimes we hold everything else constant (ceteris paribus) when conducting analysis in economics. This allows us to explore the effects that one variable has on another without worrying about the potential cross-impacts that variables can have on each other. Is this the most accurate--real world way to run predictions? No, but it is one method used by analysts and economists to try to better understand how different variables affect one another. So this post went over an easy way to remember the difference between exogenous and endogenous variables. If you have access to the graph, or equations, look at the variables controlled for on the axis, or controlled for on the right hand side with a slope coefficient. What is explain in the text and video on endogenous does not match. Text say both are endogenous but in the video he mention that only Q is endogenous. haha, it depends how you look at it I suppose. If all you are given is Q = a +bP then Q is endogenous because P is determined outside of the system. The trick here is to determine which variable is determined OUTSIDE of the system (thus exogenous). If you have P = Q/b - a/b then Q is now endogenous because it is determined outside of the equation. Thank you sir, this is really help. Excellent!! I never thought of this when I explained it to my student! Thanks a lot! The whole website is all about the math student and the difference between endogenous and exogenous variables, considering the determinates of demand. This one have very important concept and i think above content is all about it. However, I fully try to get assignmentman discount code but here i must say i got a lot of solutions of math related problems. Math students always find difficulties in all questions. The way that you have described really helped me to better understand. With a clear diagram we can easily learn. I always ask questions through qanda. They always teach better.